Netgear's first 802.11ac router, the R6300, will go on sale next week for $200, the company announced at a news conference yesterday. Touting the benefits of the next-gen Wi-Fi standard, the company also announced two more 802.11ac products: a lower-end router and a USB adapter for notebooks, both due this summer. Netgear officials continue to maintain that the company is the first to bring 802.11ac products to market, even though Buffalo Technology's first 802.11ac router and an 802.11ac media bridge are already on sale on Frys.com and Newegg.com. A Netgear official at yesterday's press event said he had ordered a Buffalo unit from Newgg in order to verify actual availability, but that he had not yet received it. While the 802.11ac standard uses the same unlicensed frequency spectrum as routers based on the older 802.11g (2.4GHz), 802.11a (5GHz), and 802.11n (2.4- and 5GHz) standards, 802.11ac routers are capable of packing three times more data into each spatial stream. Where an 802.11n router can stream data at speeds of up to 150 megabits per second (Mb/s) on each antenna, an 802.11ac router can deliver data at speeds of up to 450 Mb/s on each antenna. The R6300, which will retail for $200, will deliver its highest performance--theoretical throughput of up to 1,300 Mb/s--with its 802.11ac radio (three antenna x 450 Mb/s = 1,300 Mb/s). A second, 802.11n radio operating on the 2.4GHz frequency band uses the same three antennas to deliver theoretical throughput of up to 450 Mb/s (3 x 150 = 450). The R6300 will also offer a slew of usability extras through Netgear's Genie software for Macs, PCs, and iOS and Android smartphones and tablets. Among other things, Genie lets you monitor and manage your network remotely; print from iOS devices to any networked printer (no AirPrint support required); and create guest accounts (so that guests can access the Internet, but not your programs or data files). Netgear's software also lets you set parental controls at the router level, so there's no need to configure each computer separately. The R6300 also has two USB ports for connecting printers and storage devices. 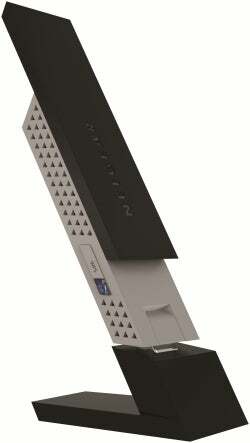 Netgear's A6200 802.11ac USB Wi-Fi adapter. Netgear's second 802.11ac router, the R6200 ($180), will include the same software, but it won't be as fast because it's equipped with only two antennas. It will deliver theoertical throughput of up to 900 Mb/s via 802.11ac (5GHz), and 300Mb/s via 802.11n (2.4GHz). It will also have only one USB port. 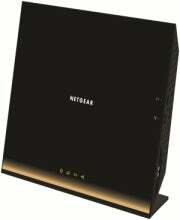 Netgear says the R6200 will be available in August. Since you can't buy a notebook, Blu-ray player, or smart TV with 802.11ac capabilities today, you'll also need to purchase an 802.11ac Wi-Fi adapter to realize the throughput speeds the standard promises. To that end, Netgear also announced the A6200 USB Wi-Fi adapter ($80). The A6200, however, won't be capable of performing at the highest levels the 802.11ac standard boasts. Netgear tells us it will be capable of speeds up to 867 Mb/s when connected to an 802.11ac radio, and 300 Mb/s when connected to a 2.4GHz 802.11n radio. To get maximum 802.11ac performance--and to support up to four wired clients in one location--Netgear recommends purchasing a matching router and configuring it as an 802.11ac wireless bridge. The 5GHz freqency band is much less crowded than the 2.4GHz band, but it also delivers much less range. When we asked a Netgear spokesperson about this issue, he said that while the 802.11ac radio they're using isn't any more powerful than the typical 5GHz 802.11n radio, the Broadcom chipset Netgear using is much more sensitive to incoming signals. This would enable the router to deliver better range because its receiver will pick up signals over longer distances, according to the spokesperson.